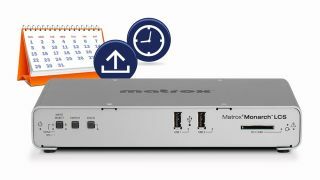 Matrox Video, a leader in broadcast and streaming video technology, has released a major firmware update for the H.264-based Matrox Monarch LCS lecture capture appliance. Updates include a new scheduler function, through which the Monarch LCS can now be set to start automatically before an event (e.g. lectures, corporate presentations, religious services) without any human intervention required. The Monarch LCS scheduler supports the iCalendar (.ics) standard, which can be generated by a variety of scheduling applications including Google Calendar and Microsoft Outlook. Allowing identification of multiple devices on a single master calendar when the schedule is imported to a Monarch LCS appliance, it will automatically start and stop streaming and recording events at times corresponding to that individual device. The Monarch LCS’s updated ability to record files locally to an SD card or attached USB drive, and then transfer the data to network-mapped drives at a later time, is beneficial for IT administrators as it reduces the demand on the network during peak times. This also avoids data loss during peak-hour transfers due to errors or connectivity issues. Transfers can be triggered manually or preprogrammed to occur at a preset time each day. The Monarch LCS tracks successful file transfers and avoids retransferring unless it is specifically requested. Failed or incomplete transfers are also tracked and tagged for future retransfer. The latest Monarch LCS firmware is now available to registered users as a free download from the Matrox website.